In 2014, Microsoft announced the Azure Preview Portal, which was going GA in December 2015. 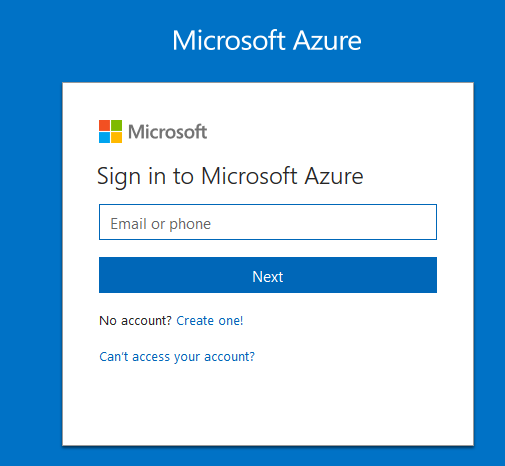 Since January 8, 2018, the classic Azure Portal is turned off. The “Preview Portal” was more than a facelift. The classic Azure Portal was based on the Service Management mode, often called the “classic deployment model”, whereas the new Azure Portal uses the Resource Manager model. Azure Service Management (ASM) and Azure Resource Management are both deployment models. The Resource Manager model eases the deployment of complex setups by using templates to deploy, update and manage resources within a resource group as a single operation. Different deployment models require different tools. Because of this, Microsoft offers two PowerShell modules for Azure. Depending on your deployment type, you have to use the Azure or AzureRM module. Both can be installed directly from the PowerShell Gallery using Install-Module -Name Azure or Install-Module -Name AzureRM . 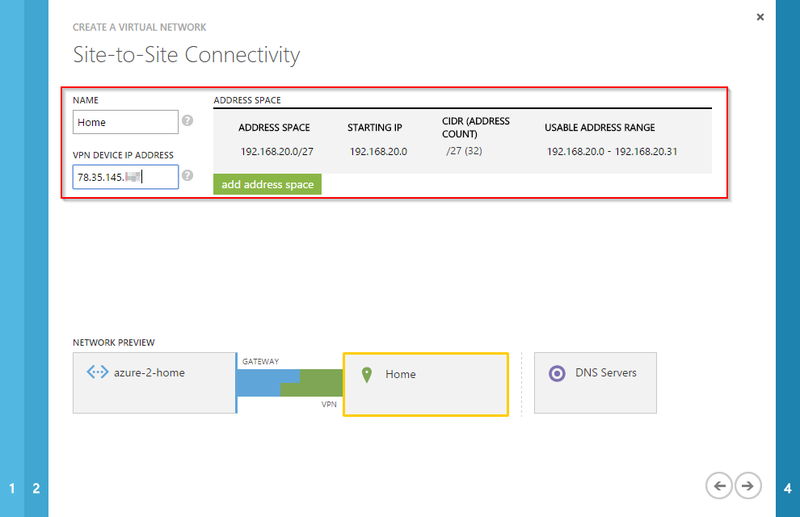 Depending on the used module, the ways to connect to Azure differ. You will notice, that AzureRM sessions does not persist between PowerShell sessions. This behaviour differs from Add-AzureAccount . But you can save and load your AzureRM session once you are connected. This entry was posted in Automation, Cloud and tagged azure, cloud, microsoft, powershell on March 6, 2018 by Patrick Terlisten. Both are located in different directories. The Microsoft account is located in another user database at Microsoft, as a work or school account. Latter are located in a Azure AD, which is associated with a customer. Both account types are identified using the email address. Microsoft accounts are used for service like Skype, OneDrive, but also for the Microsoft Certified Professional portal. Work or school accounts are mainly used for Office 365 and Azure. You can use your work email address for your Microsoft account, until someone creates an Azure AD, and a work or school account with the same email address is created. From this point, your login experience with the different Microsoft services will getting worse. The main problem is, that Microsoft tries to find the given account in one of their directories, and it seems that they prefer Azure AD. So the login will work, but the content of the user profile will be different, because it’s a different account. This is a screenshot from the new login screen. As you can see, there is no way to choose if you wish to login with a work/ school or Microsoft account. 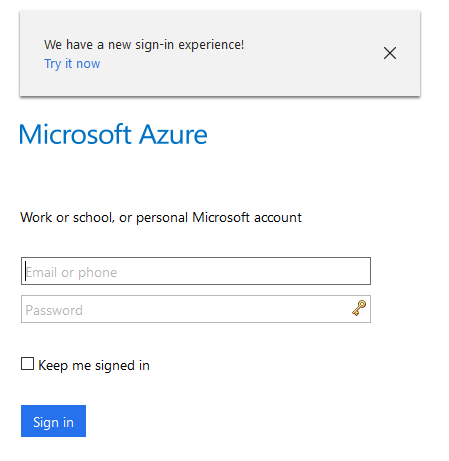 This is the old login experience, where you can choose between work/ school and Microsoft account. Because of this, you should avoid using your work email address for your personal Microsoft account. Even if this Microsoft account is linked to your MCP/ MCSE certifications. It is not a problem to use your personal Microsoft account, with your personal email address, for your certifications. And it is not a problem to link this account to a Microsoft partner account (as in my case). Maybe it will be possible to merge Microsoft and work/ school accounts someday. There is an ongoing discussion about this since 2013 (Merge office365 and live accounts that use the same email address). To remove your work or school email address from your personal Microsoft account, follow the instructions in this support artice (Rename your personal account). This entry was posted in Cloud and tagged azure, cloud, microsoft, office 365 on November 24, 2017 by Patrick Terlisten. When I talk to customers and colleagues about cloud offerings, most of them are still concerned about the cloud, and especially about the security of public cloud offerings. One of the most mentioned concerns is based on the belief, that each and every cloud-based VM is publicly reachable over the internet. This can be so, but it does not have to. It relies on your design. Maybe that is only a problem in germany. German privacy policies are the reason for the two german Azure datacenters. They are run by Deutsche Telekom, not by Microsoft. An Azure Virtual Network (VNet) is a network inside the public Azure cloud. It is isolated from the underlying infrastructure and it is dedicated to you. This allows you to fully control IP addressing, DNS, security policies and routing between subnets. Virtual Networks can include multiple subnets to reflect different security zones and/ or multi-tier designs. If you want to connect two or more VNets in the same region, you have to use VNet peering. Microsoft offers an excellent documentation about Virtual Networks. Because routing is managed by the Azure infrastructure, you will need to set user-defined routes to push traffic through a firewall or load-balancing appliance. Palo Alto Networks was founded by Nir Zuk in 2005. Nir Zuk is the founder and CTO of Palo Alto Networks. He is still leading the development. Nil Zuk is a former employee of CheckPoint and NetScreen (was acquired by Juniper Networks). His motivation to develop his vision of a Next Generation Firewall (NGF) was the fact, that firewalls were unable to look into traffic streams. We all know this: You want that your employees can use Google, but you don’t want them to access Facebook. Designing polices for this can be a real PITA. You can solve this with a proxy server, but a proxy has other disadvantages. Gartner has identified Palo Alto Networks as a leader in the enterprise firewall since 2011. I was able to get my hands on some Palo Alto firewalls and I think I understand why Palo Alto Networks is noticed as a leader. Sometimes you have to separate networks. No big deal when your servers are located in your datacenter, even if they are virtualized. But what if the servers are located in a VNet on Azure? 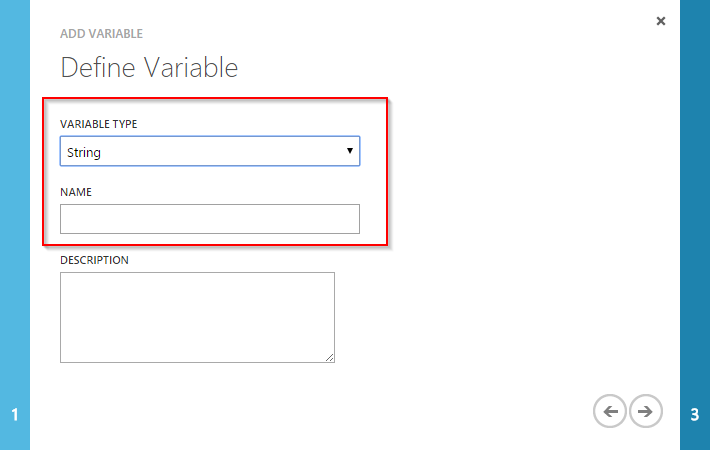 As already mentioned, you can create different subnets in an Azure VNet to create a multi-tier or multi-subnet environment. Because routing is managed by the underlying Azure infrastructure, you have to use Network Security Groups (NSG) to manage traffic. A NSG contains rules to allow or deny network traffic to VMs in a VNet. Unfortunately a NSGs can only act on layer 4. If you need something that can act on layer 7, you need something different. Now comes the Palo Alto Networks VM-Series for Microsoft Azure into play. 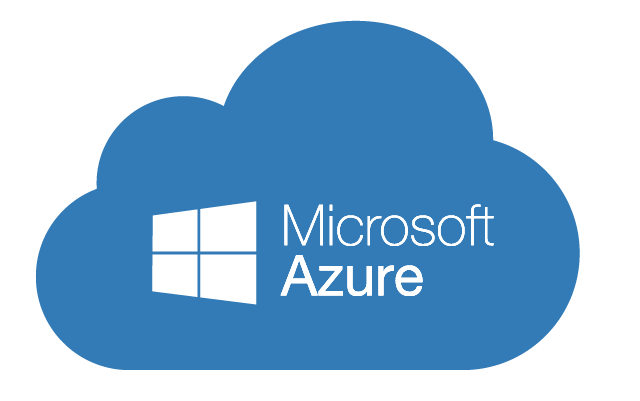 The VM-Series for Microsoft Azure can directly deployed from the Azure Marketplace. Palo Alto Networks also offers ARM templates on GitHub. The hybrid cloud use-case is interesting if you want to extend your datacenter to Azure. For example, if you move development workloads to Azure. Instead of using Azures native VPN connection capabilities, you can use the VM-Series Palo Alto Networks NGF as IPSec gateway. If you are running different workloads on Azure, and you need inter-subnet communication between them, you can use the VM-Series as a firewall between the subnets. This allows you to manage traffic more efficiently, and it provides more security compared to the Azure NSGs. If you are running production workloads on Azure, e.g. a RDS farm, you can use the VM-Series to secure the internet access from that RDS farm. Due to integration in directory services, like Microsoft Active Directory or plain LDAP, user-based policies allow the management of traffic based on the user identity. There is a fourth use-case: Palo Alto Networks GlobalProtect. With GlobalProtect, the capabilities of the NGF are extended to remote users and devices. Traffic is tunneled to the NGF, and users and devices will be protected from threats. User- and application-based policies can be enforced, regardless where the user and the device is located: On-premises, in a remote location or in the cloud. The consumption-based licensing is only available for the VM-300. The smaller VM-100, as well as the bigger VM-500 and VM-700, are only available via BYOL. It’s a good idea to offer a mid-sized model with a consumption-based license. If the VM-300 is too big (with consumption-based licensing), you can purchase a permanent license for a VM-100. If you need more performance, purchasing your own license might be the better way. You can start with a VM-300 and then rightsize the model and license. All models can handle a throughput of 1 Gb/s, but they differ in the number of sessions. VM-100 and 300 use D3_v2, the VM-500 and VM-700 use D3_v2 instances. 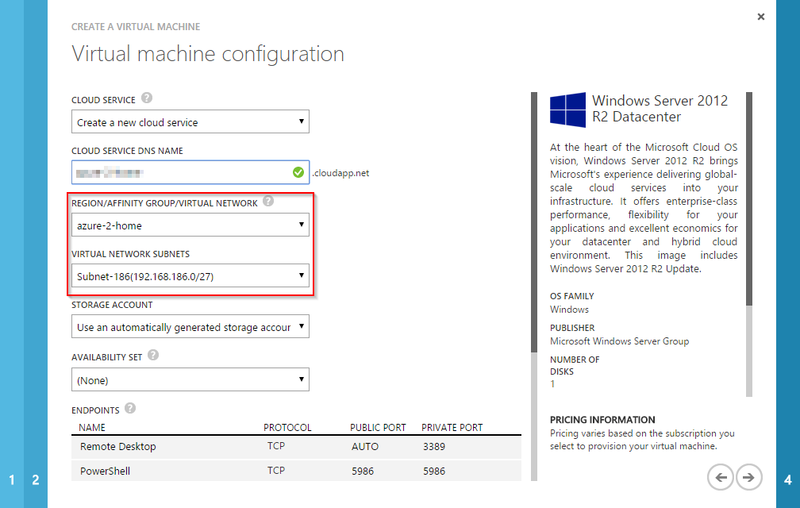 Just create some Azure VM instance and deploy a VM-300 from the marketplace. Play with it. It’s awesome! This entry was posted in Cloud and tagged azure, cloud, firewall, microsoft, networking, palo alto networks, pan-os, security on February 19, 2017 by Patrick Terlisten. One of my personal predictions for 2017 is, that Microsoft Azure will gain more market share. Especially here in Germany. Because of this, I have started to refresh my knowledge about Azure. A nice side effect is that I can also improve my PowerShell skills. I created a new repository on GitHub and shared a first v0.1 as public Gist. Please note, that this is REALLY a v0.1. This entry was posted in Cloud and tagged automation, azure, lab, microsoft, powershell on January 16, 2017 by Patrick Terlisten. If you want to use an Active Directory account, you have to create a credential asset in the Automation account and provide username and password for that Active Directory account. You can retrieve the credentials using the Get-AzureAutomationCredential cmdlet. This cmdlet returns a System.Management.Automation.PSCredential object, which can be used with Add-AzureAccount to connect to a subscription. If you want to use a certificate, you need four assets in the Automation account: A certificate and variables with the certificate name, the subscription ID and the subscription name. The values of these assets can be retrieved with Get-AutomationVariable and Get-AutomationCertificate. Before you start, you need a certificate. This certificate can be a self- or a CA-signed certificate. Check this blog post from Alice Waddicor if you want to start with a self-signed certificate. I used a certificate, that was signed by my lab CA. First, you must upload the certificate to the management certificates. Login to Azure and click “Settings”. and select “Upload” at the bottom of the website. Make sure that the certificate has the correct format and file name extension (.cer). Finish the upload dialog. After a few seconds, the certificate should appear in the listing. Now it’s time to create the Automation account. Select “Automation” from the left panel. Click on “Create an Automation account”. Give your Automation account a descriptive name and select a region. 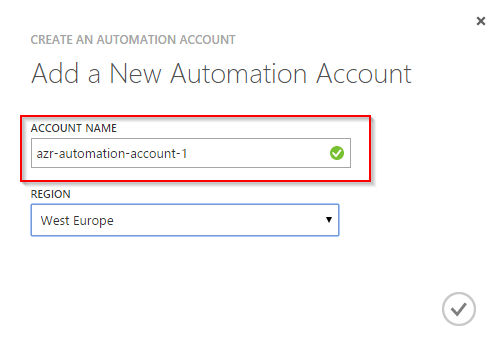 Please note that an Automation account can manage Azure services from all regions! Click on the newly created account and click on “Assets”. 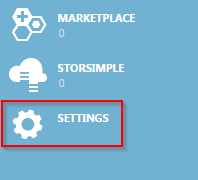 Select “Add setting” from the bottom of the website. 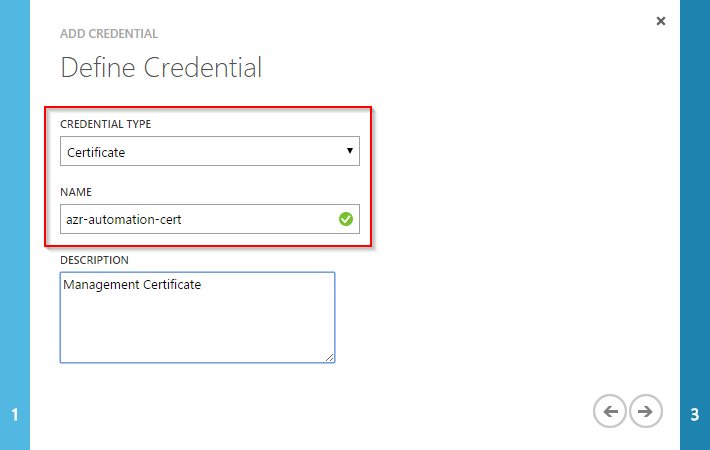 Add a credential asset by choosing “Add credential” and select “Certificate” as “Credential type”. Enter a descriptive name for the certificate. You should remember this name. You will need it later. Now you have to upload the certificate. 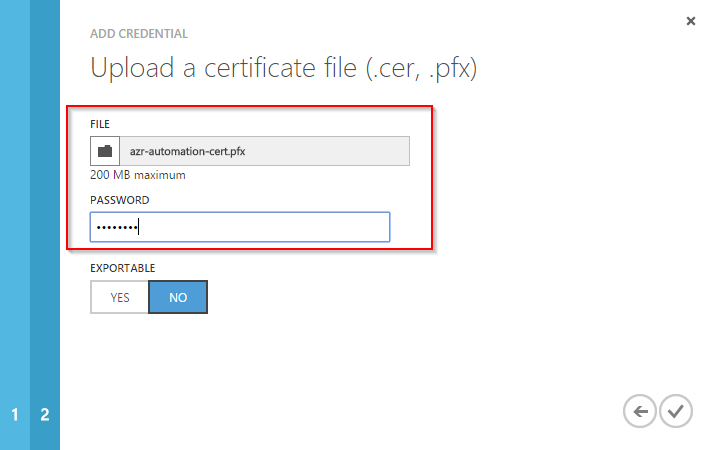 The certificate must have the file name extension .pfx or .cer and it must include the private key! Finish the upload of the certificate. Now add three additional assets (variables). Select the name, the value and the type from the table below. The name of the certificate is the descriptive name, you’ve previously entered when uploading the certificate. Done. You’ve uploaded and created all the required certificates and variables. 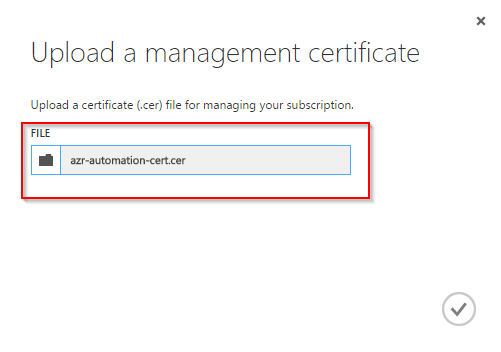 $AzureSubscriptionName = Get-AutomationVariable -Name "AzureSubscriptionName"
$AzureSubscriptionID = Get-AutomationVariable -Name "AzureSubscriptionID"
$AutomationCertificateName = Get-AutomationVariable -Name "AutomationCertificateName"
Certificate-based authentication is an easy way to authenticate an Automation account against an Azure subscription. It’s easy to implement and you don’t have to maintain users and passwords. You can use different certificates for different Automation accounts. I really recommend this, especially if you have separate accounts for dev, test and production. All you need is to upload a certificate as a management certificates, and as a credential asset in the Automation account. You can use a self- or CA-signed certificate. The subscription ID, the subscription name and the name of the certificate are stored in variables. At the beginning of each runbook, you have to insert a code block. This code block takes care of authentication. This entry was posted in Automation and tagged automation, azure, cloud, industrialization, microsoft, operations management on November 12, 2015 by Patrick Terlisten. Automation is essential to reduce friction and to streamline operational processes. It’s indispensable when it comes to the automation of manual, error-prone and frequently repeated tasks in a cloud or enterprise environment. Automation is the key to IT industrialization. Azure Automation is used to automate operational processes withing Microsoft Azure. The very first thing you have to create is an Automation account. You can have multiple Automation accounts per subscription. An Automation account allows you so separate automation resources from other Automation accounts. Automation resources are runbooks and assets (credentials, certificates, connection strings, variables, scheudles etc.). So each Automation account has its own set of runbooks and assets. This is perfect to separate production from development. An Automation account is associated with an Azure region, but the Automation account can manage Azure services in all regions. A runbook is a collection of PowerShell script or PowerShell workflows. You can automate nearly everything with it. If something provides an API, you can use a runbook and PowerShell to automate it. A runbook can run other runbooks, so you can build really complex automation processes. A runbook can access any services that can be accessed by Microsoft Azure, regardless if it’s an internal or external service. Graphical runbooks can be created and maintained with a graphical editor within the Azure portal. Graphical runbooks use PowerShell workflow code, but you can’t directly view oder modify this code. Graphical runbooks are great for customers, that don’t have much automation and/ or PowerShell knowledge. Once you created a graphical runbook with an automation account, you can export and import this runbook into another automation accounts, but you can modify the runbook only with the account which was used during the creation of the runbook. PowerShell Workflow runbooks doesn’t have a graphical presentation of the workflow. You can use a text editor to create and modify PowerShell Workflow runbooks. But you need to know how to deal with the logic of PowerShell Workflow code. PowerShell runbooks are plain PowerShell code. Unlike PowerShell Workflows, a PowerShell runbook is faster, because it doesn’t have to be compiled before the run. But you have to be familiar with PowerShell. There is no parallel processing and you can’t use checkpoints (if a snapshot fails, it will be suspended. With a checkpoint, the workflow can started at the last sucessful checkpoint). Schedules are used to run runbooks to a specific point in time. Runbooks and schedules have a M:N relationship. A schedule can be associated with one or more runbooks, and a runbook can be linked to one or more schedules. This is only a brief introduction into Azure Automation. Azure Automation uses Automation accounts to execute runbooks. A runbook consists of PowerShell Workflow or plain PowerShell code. 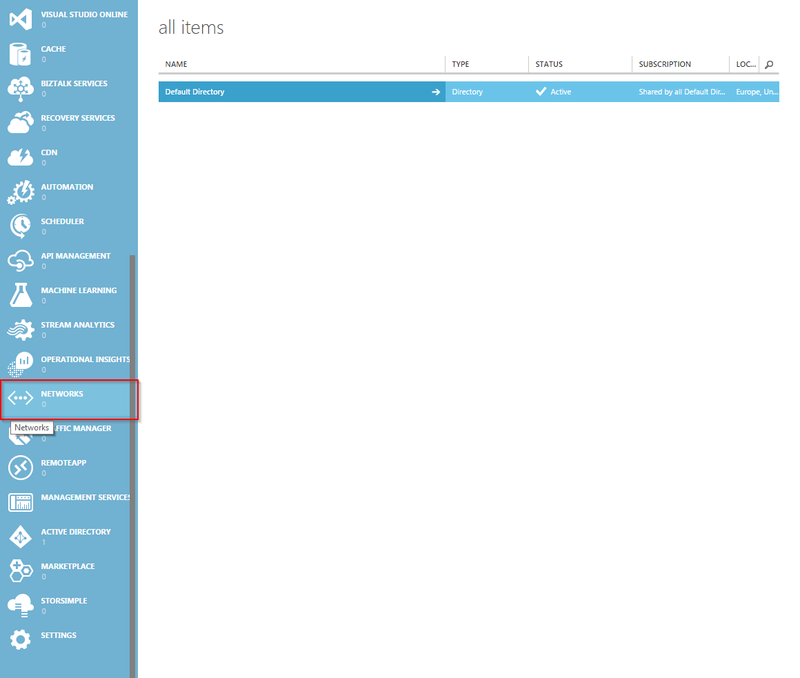 You can use runbooks to automate nearly all operations of Azure services. To execute runbooks to a specific point in time, you can use schedules Runbooks, schedules and automation assets, like credentials, certificates etc., are associated with a specific Automation account. This helps you to separate between different Automation accounts, e.g. accounts for development and for production. To be honest: I’m lazy and I have a wife and two kids. Therefore I have to minimize the costs of my lab. I have a physical lab at the office and some VMs running on Microsoft Azure. Azure is nice, because I only have to pay what I really use. And because I’m only paying the actual use, I start the VMs only when I need them. Inspired by this very handy Azure VM wakeup & shutdown script, I decided to write my own script (yes, I invented a wheel again…). Very simple, nothing fancy. Feel free to use and modify the script according to your needs. This entry was posted in Automation and tagged automation, azure, microsoft, powershell on September 22, 2015 by Patrick Terlisten. Building networks in the cloud is sometimes hard to understand. A common mistake is to believe that all VMs can talk to another, regardless of the owner, and that all VMs are available over the internet. When we talk about Microsoft Azure, a Cloud Service Endpoint is the easiest way to access one or multiple VMs. A Cloud Service contains resources, like VMs, and it’s acting as a communication and security boundary. All VMs that use the same Cloud Service get their IPs via DHCP and share the same private IP address range. The VMs can communicate directly to each other. To access these VMs over the internet, a Cloud Service Endpoint is used. Each Cloud Service has a internet addressable virtual IP address assigned. And that’s the Cloud Service Endpoint. With PAT, ports for RDP or PowerShell are forwarded to the VMs by default. If you deploy a webserver and an application server, both can be provisioned to the same Cloud Service and therefore, they share the same Cloud Service Endpoint. But you can only forward http traffic to the webserver. Therefore only the webserver is available over the internet, not the application server. If you need more complex networking within Microsoft Azure, you may take a look at the Virtual Networks (VNets). VNets are used to create and manage isolated networks within Microsoft Azure. Each VNet has its own choosable IP address range. VNets can be linked to other VNets and on-premises networks using VPN techniques. VNets allow you to assign “your own” IP addresses to VMs. To be honest: You can define “your own” IP subnet, but even with Set-AzureStaticVNetIP, you can’t assign a real static IPs to those VMs. It’s more a kind request to get the same IP everytime the VM boots up. With VNets you can extend your on-premises network to Microsoft Azure. You can deploy test and development environments to Microsoft Azure and connect to the used VNets using IPsec. Or you can run you whole datacenter within Microsoft Azure and only have PCs and laptops on-premises. 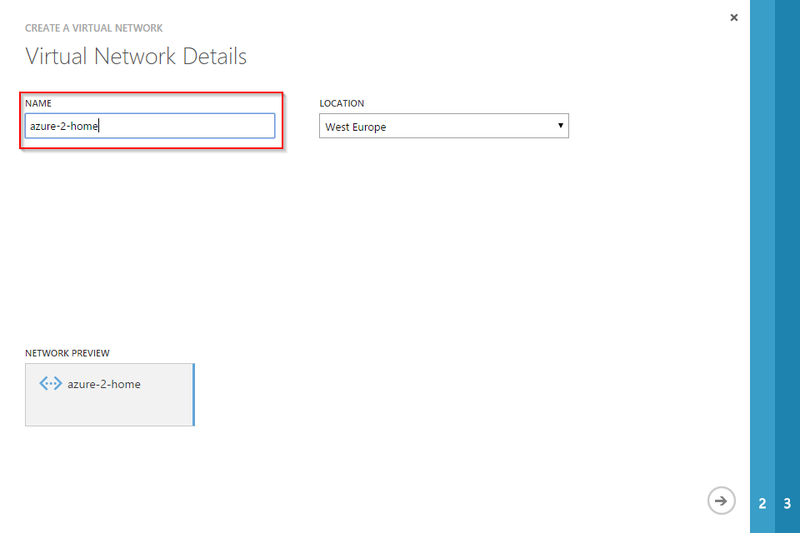 In this blog article, I’d like to show you how you connect your on-premises network to a Microsoft Azure Virtual Network. In this case, I used my AVM FRITZ!Box 7270 as the VPN gateway in my on-premises network. Many well-known manufacturers are listed on the compatibility list. The very first step is to create a Virtual Network (VNet) in the Microsoft Azure portal. Select “NETWORKS” from the left panel and create a new VNet. You should assign a descriptive name to your VNet. Just an information: The datacenter for the local “West Europe” is located in the Netherlands. Currently there is no datacenter in Germany. If you have a DNS server in your local network, you can add it in step two of the “Create a Virtual Network” wizard. Make sure that you select the “Configure a site-to-site VPN” checkbox. Otherwise you can’t create a IPsec tunnel. 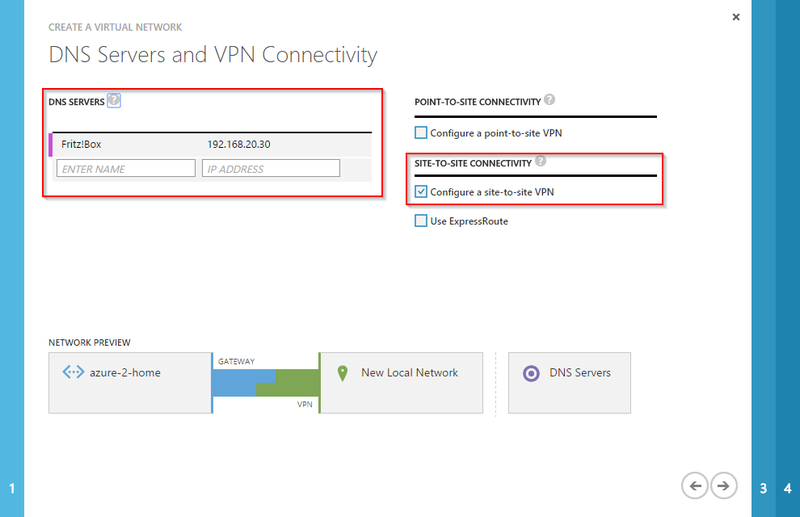 In the third step, you have to enter details about your on-premises network and the VPN device. The VPN device address is the public address of your VPN gateway. You have to use an IP address here. You can’t use a FQDN. So make sure that you have a static IP address! I don’t have one. This means that I have to change my VNet config each time my public IP changes (all 24h). 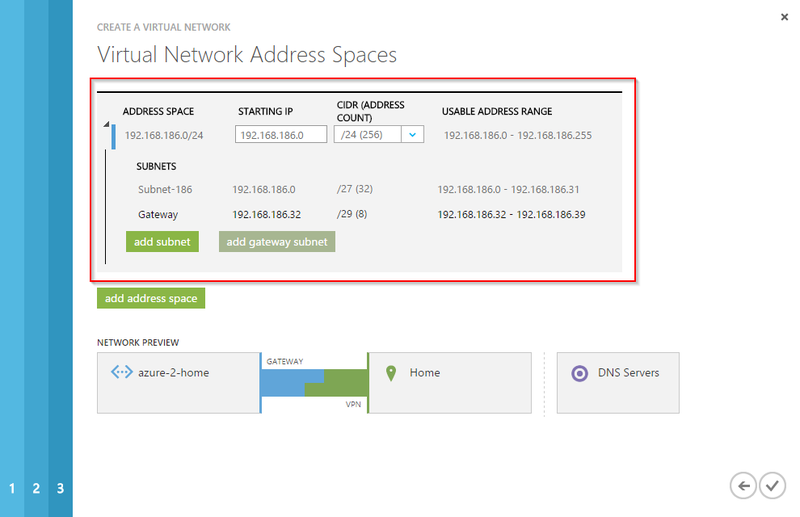 Enter the address spaces of your local IP subnets. The “Virtual Network Address Space” defines the IP subnet which should be used for the VMs that will be provisioned to this VNet. And you have to add a subnet for the gateway. The gateway subnet is used for the IPsec connection. Please note that this subnet can’t be used for VMs. The creation of the VNet takes some time. After a couple of minutes you should be able to click on “VIRTUAL NETWORKS”, “LOCAL NETWORKS” and “DNS SERVERS” and you should see the values you’ve entered. In the “LOCAL NETWORKS” section you can see the address space of your local network, as well as the IP of your VPN gateway. If you don’t have a static IP address, you have to change the VPN gateway address here everytime the IP address changes. Last but not least: The DNS server of your local network. The next step is to create a gatway. The gateway is necessary for the IPsec connection. Click on “CREATE GATEWAY”. Select “Static Routing”. That’s all. The creation of the gatway will take some time. I had to wait about 5 minutes until the gateway was created. After the creation of the gateway, you should see the gateway IP address. This address is the VPN endpoint from the perspective of your local network. Beside the gateway IP address, you also need the shared key to create an IPsec tunnel. 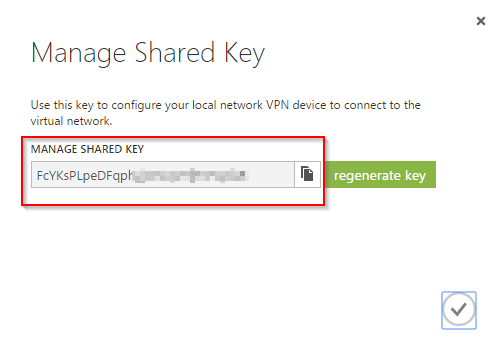 Click on “MANAGE KEY” to get the pre-shared key. Copy the pre-shared key and save it for later use. Now the configuration of the VNet is finished. Now it’s time to configure your on-premises VPN gateway. In my case it’s a AVM FRITZ!Box which isn’t listed on the compatible device list. You have to create and import a config file. This is the config file I’ve used. I highlighted the parts of the config that you have to modify. Please note, that previously created VPN connections may be deleted if you import this file. If you have additional VPN connections configured on your FRITZ!Box, please make sure that you add them to this file BEFORE you import it. You can use my config as a template for your VPN config. Simply change the highlighted values, remove the comments and import it into your FRITZ!Box. Don’t forget to remove the comments in the config file. Don’t remove the comments at the beginning of the file. Only remove the comments I added to highlight the values you have to change. If everything’s fine, the IPsec tunnel should be established within a couple of seconds. As soon as the IPsec tunnel is established, you should be able to ping the gateway IP address. In my case it’s the IP address 192.168.186.37. 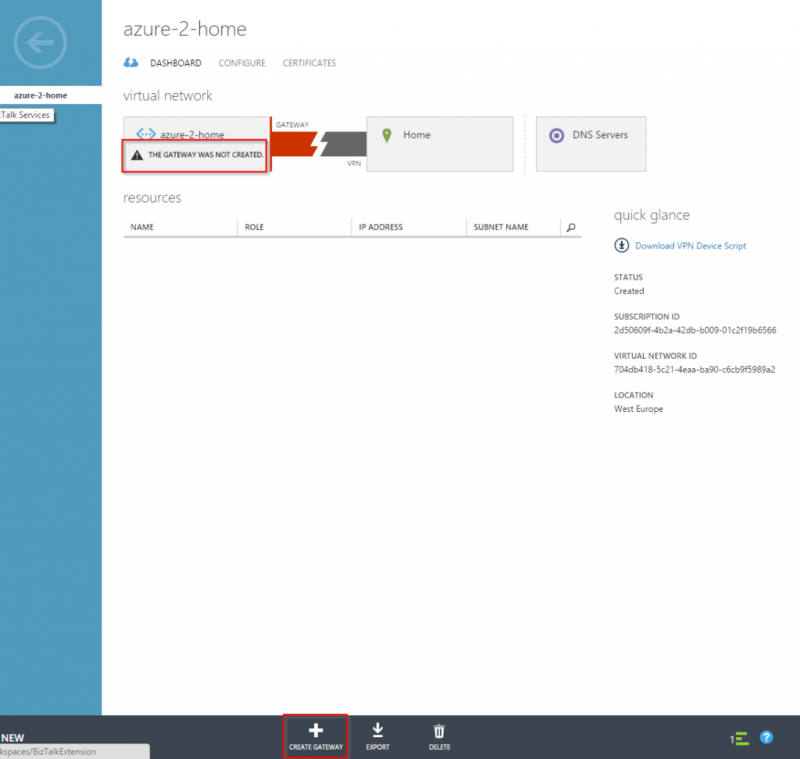 If you create a new Azure VM, you can now use your newly created VNet and subnet. Simply choose the VNet from the “REGION/ AFFINITY GROUP/ VIRTUAL NETWORK” drop down menu. The first VM will get the IP address 192.168.186.4. Why the .4 when the first usable address is .1? The first four IP addresses of the address space are reserved. So the first usable IP address is 192.168.186.4. The second VM will get the 192.168.186.5 and so on. The same applies to the gateway address space. If you connect your on-premises network to Microsoft Azure, you should know that you can use up to 80 Mbps with an availability SLA of 99.9% and no performance commitment! If you need more bandwidth, you can use a High Performance Gatway which can deliver up to up to 250 Mbps. I would recommend to use VNets whenever it’s possible. Not only in case of connecting a on-premises network. If you wish to use VPN features, take a look at the VPN gateway compatibility list! Otherwise, the connecting your on-premise network to Microsoft Azure might be a bit fiddly. This entry was posted in Networking and tagged azure, cloud, microsoft, networking on September 18, 2015 by Patrick Terlisten.